You never know when you will need to dress to impress. 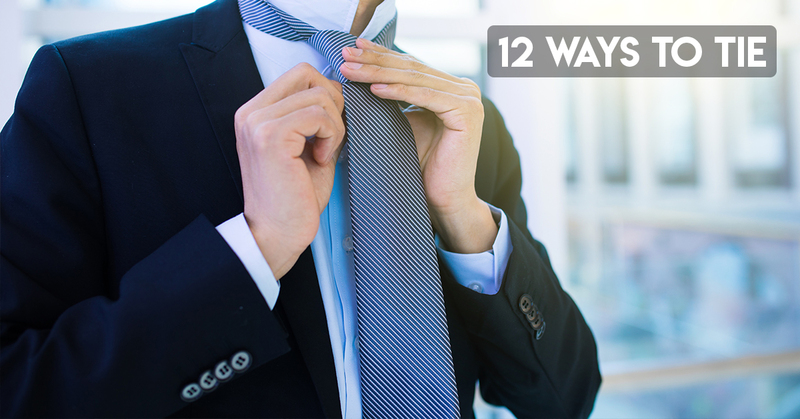 In case you are stuck in the same old routine of formal wear, here are 12 different ways to tie a tie. Four-in-Hand: This knot shares the name of an English Gentleman’s Club in the 19th Four-in-hand was a driving club. Horse-drawn coaches are no longer around today, but the knot style popularized by these Englishmen is perhaps the most used knot. Half-Windsor: Named after the legendary Duke of Windsor himself, the Half-Windsor knot is a simple and symmetrical style. Windsor: Also known as the Double-Windsor, this extra-wide knot was created by the public in an attempt to imitate the Duke’s peculiar style. Simple: As the name suggests, this knot takes the fewest steps to tie. Its popularity is greatest in China. Prince Albert: This knot named after the husband of Queen Victoria is a fuller and inverse version of the Kelvin. Eldredge: This truly modern knot is complex and unorthodox. The finished result is a large tapered fishtail braid-like effect. It was created by Jeffrey Eldredge and popularized in 2008. Van Wijk: The tallest knot around was created by Lisa Van Wijk and essentially looks like the side view of some sort of cinnamon roll or baked good. Trinity: Also, a modern and complex knot. The Trinity resembles the Celtic Triquetra knot. Murrell: This knot defies convention. It is an inversion of the classic Windsor. In all other knots, the small part of the tie hides from view. The Murrell is all about the small part being up front and center. Balthus: Absolutely the largest knot known to man. The Balthus knot was invented in the 1930’s by a Polish-French artist. The knot is wrapped around itself until there is nothing left to wrap around. Bow -Tie: The classic bow-tie is the distant cousin of the neck-tie. Originally designed as a tie for the active man, today the bow-tie is typically worn at formal occasions.